England's medieval queens were elemental in shaping the history of the nation. In an age where all politics were family politics, dynastic marriages placed English queens at the very centre of power - the king's bed. From Matilda of Flanders, the Conqueror's queen, to Elizabeth of York, the first Tudor consort, England's queens fashioned the nature of monarchy and influenced the direction of the state. Occupying a unique position in the mercurial, often violent world of medieval state-craft, English queens had to negotiate a role that combined tremendous influence with terrifying vulnerability. Lisa Hilton's meticulously researched new book explores the lives of the twenty women who were crowned queen between 1066 and 1503, reconsidering the fictions surrounding well-known figures like Eleanor of Aquitaine and illuminating the lives of forgotten figures such as Adeliza of Louvain. 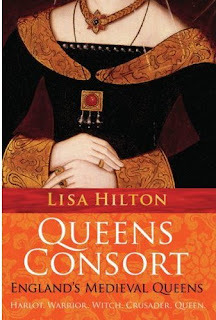 War, adultery, witchcraft, child abuse, murder - and occasionally even love - formed English queenship, but so too did patronage, learning and fashion.Lisa Hilton considers the evolution of the queenly office alongside intimate portraits of the individual women, dispelling the myth that medieval brides were no more than diplomatic pawns. From Eleanor of Castile's eccentric passion for fruit to Anne of Bohemia's contribution to the Protestant reformation, QUEENS CONSORT is a provocative and dramatic narrative which redefines English history in terms of an exceptional group of women whose personal ambitions, triumphs and failures helped to give birth to the modern state. Oooh, I very much want this. I have this one (the UK edition). Haven't read it straight through, but the sections I have read are quite good. It's very well written and the research is solid. Like Susan, I've also heard that this book is right on for the research. You've got to stop posting these..my list is getting too long! Are you TRYING to bankrupt me???? Geez, our suitcases are going to be so full of damned books we won't even have time to enjoy Scotland! can't wait to put this one near the top of my pile - is it so that in every Queen there is a woman? one with potential at the beginning and beauty in their person? This one sounds terrific too. Sigh. Ooh, I so want to buy this book when I'm in London next week, but I don't think I have room for a hardcover! Ooh, this one looks good!